Molela is a small, non descript village in the Rajsamand district of Rajasthan, situated on the banks of the river Banas. Normally, it could pass off as an ordinary village, one of the thousands that you pass by while traversing the rural landscape of our country. The distinction here lies in the terracotta plaques made here, only here all over India. Made as a flat surface, unlike the usual idols made elsewhere, this craft is unique in design. This craft has existed since generations and caters to the tribals who travel from as far as Madhya Pradesh to buy them every year. 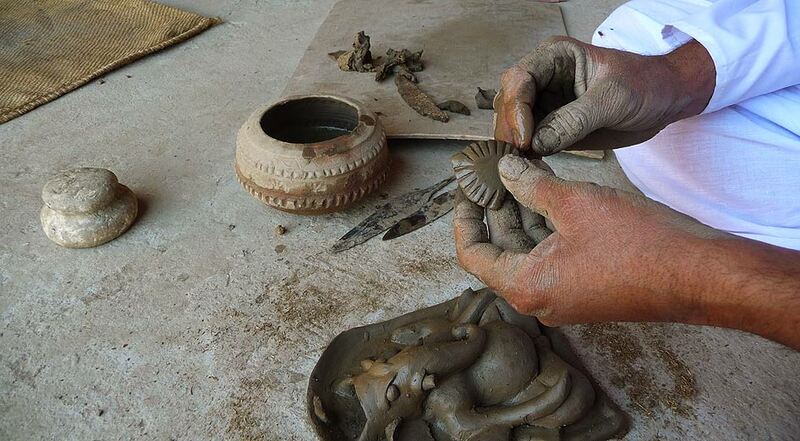 Once a year, in the months of Feb-Mar, the tribals buy the brightly painted terracotta plaques from these potters. Usually a priest accompanies them for this ritual of buying. The most important figures are that of Devnarayan(Dharmaraja) and Nagaraja(the snake God). The tribals prefer bright colours for Gods and there are specific colours to depict each God. For instance, Blue is used for Kaladev and Orange is used for Goradev. The tribals usually change these votives every year. These rituals are believed to prevent misfortune. They consider these Gods as their protectors. There is a legend behind this unique craft that claims that there was a blind potter, who dreamt of God Devnararyan (Dharmaraja). The God asked him to dig clay at a particular place and make his image. The next morning, his sight was restored. He made the God’s image to fulfill his promise. Thus the future generations took to this craft. The traditional design is an image of Dharamaraja on a horse. Recently this craft has evolved to suit the times and there are new designs like that of village life or wedding processions that are sold. This ensures business throughout the year and the craftsmen are adapting well to these requirements. These plaques are used as decorative elements in walls. Molela clay is muddy in colour. It is dug from the banks of Banas river, 2 Kms away from Molela on Nathdwara Road. Each potter has his own spot for digging based on his own previous experiences. For the colours, they use natural stone and mineral colours. Palewa is the clay slip and makes different colours when mixed with other elements. For instance, silver is made with Palewa and water. The reddish colour is made when Geru(Red soil) is added to the mixture. As the binder, they use a vegetable gum called Dawrigund collected from the trees. For shine, they apply a lacquer coat which is locally called a Jala. Varnish is never used because it is of organic material which is prohibited for use on Gods. Only one family makes the Jala in the entire region. Molela’s clay is well suited for this design. The weather is conducive for this process in the winter months, as the harsh summers cause cracks while drying the product. In the process, first donkey dung powder is spread on the ground. The slab is beaten with the pindi. While making the slab, the pindi is cleaned with the tool called baldi. When the slab becomes 1.5 inch thick, a wooden tool called patiya is used for beating. After this, approx measurement are taken with the palm and the surface is smoothened by hand. Having cut the main shape, thick coils are made,flattened and added to the main slab to make a shape. Thin coils are used for detailing. For instance, for making a face, pasting of the slab is done in such a way that it generates overall facial form. Square coils are used to make nose shapes. The jewellery is made out of tiny balls of clay. The final product is dried in the sun and the dried plaques are then fired in the kiln slowly. The fired product is painted with natural bright colours.